Thank you so much to WOVEMBER reader KATA, who wanted to contribute a little nod to knitting from the late Terry Pratchett’s Discworld series. She fumbled in the bottomless storeroom of her knickerleg and produced a couple of pairs of socks so thick that they could have stood up by themselves. The heather ripped fruitlessly at the wire-like wool as the women hurried over the moor. There was still a sun here, or at least a bright spot in the overcast, but darkness seemed to come up from beneath the ground. That last sentence seems like it was written for these cold, dark winter evenings! 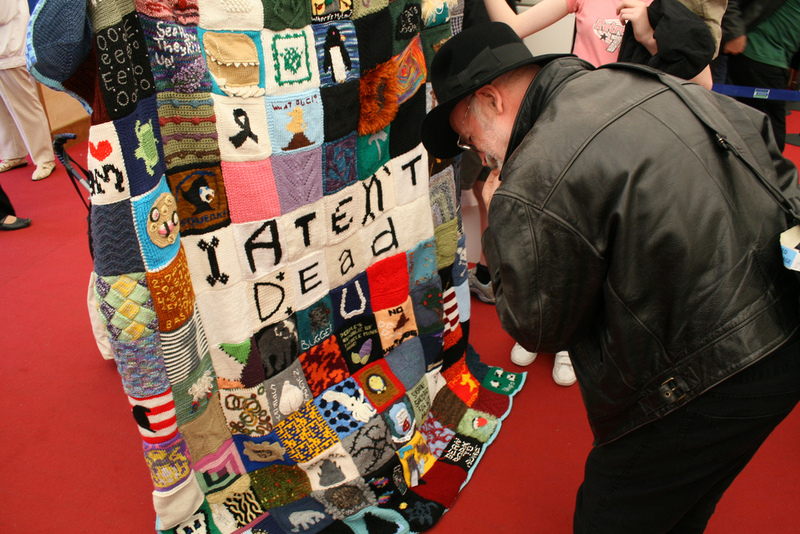 In 2008 knitting fans of Terry Pratchett created the Pratchgan quilt. The Ankh Morpork Knitter’s Guild were inspired to create the blanket – each square with a different motif relating to DiscWorld – after Practchett’s diagnosis of Altzhiemer’s. They got to present the finished quilt to him in August, 2008. You can read more about this project here. Images: Jeans Socks. Free pattern from Blacker Yarns. The Pratchgan – image shared from The Pratchgan Group on Flickr, via SA CC license.